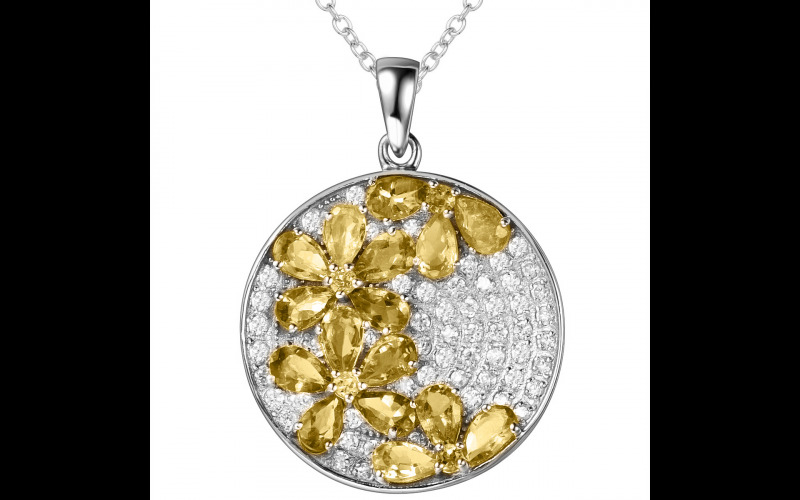 H.AZEEM is giving away this beautiful Citrine gemstone flower pattern set with cubic zircon on a sterling silver necklace. This fine detailed silver pendant from the Enchanted Empress collection is set with cubic zircon with a citrine gemstone flower pattern. Designed to be universally flattering, it an essential addition to any stylish woman’s wardrobe. The perfect partner for your favourite evening dress, this versatile pendant has been expertly crafted, and is guaranteed to make you the centre of attention. H.AZEEM is an award-winning brand specialising in natural gemstone jewellery set in sterling silver. All of our pieces use only natural gemstones, and these gems form the basis of our designs through which we strive to elevate their natural beauty. H.AZEEM offers a range of luxury jewellery collections. Collections range from fashion jewellery made from gemstones to druzy, amethyst, topaz and garnet to mother of pearl. The stones and pearls used are all sourced from natural environments in the highest quality sources, which make H.AZEEM the most luxurious and elegant jewelers online. Over the past 5 years, our designs have been featured in some of the most-read fashion magazines in UK such as Vogue, Tatler and Jewellery Focus. H.AZEEM is also the favourite choice of celebrities, like award winning Game of Thrones actress Maisie Williams and influential singer Pixie Lott.